Grace's love for the giant panda started when she was six and her passion for the panda has only grown. Last year she read a book on the Giant Panda and found out they were endangered and was sincerely upset by this fact so she decided to help save the Pandas anyway she could. For Grace's 8th Birthday we had a Panda Party and in lieu of gifts she took donations to help her achieve her dream of "adopting" a Panda. We had our own stuffed panda adoption center, panda treats, fake snow and even a visit from a Panda. Grace raised over $500 towards helping the Pandas and is excited to do her part in saving the Giant Panda. She will continue to help protect the Pandas anyway she can and dreams of going to China to volunteer with the Pandas. Thank you Grace for your amazing dedication to helping to save the Giant Pandas. Makena is on a mission; to help save the pandas! Her mission ignited at a very young age. When she was only 2 years old, she received a very special panda stuffed animal from her Aunt Mariah; a gift brought all the way from China! Over the years, Makena's love for pandas grew stronger. In kindergarten, her class pet was a panda stuffy that went home with a classmate each week. "Mr. Panda" had many adventures, and went on his first airplane ride to California while in Makena's care. This year (2018), for her 7th birthday (in February), she chose to share her love for pandas and threw a Pennies 4 Pandas Party. In lieu of all gifts, she wanted to raise money for the pandas! We made panda crafts, played panda themed games, and with the support of Pandas International were able to educate her friends about the importance of saving the pandas. Makena's party was a great success. She raised $260! She was so proud of her efforts, and her parents couldn't have been more proud of their little panda lover. Makena's mission continues! In June, she wrote and presented a paper of what she would like to be when she grows up. Her answer? A Panda Protector! In August, one of her dreams came true. On a very special surprise trip to the San Diego Zoo, Makena got to be a VIP, and came face to face with Bai Yun and Xiao Liwu; the resident pandas that inhabit the zoo. Her ultimate dream is to travel to China to see the giant pandas. Today, her collection of all things panda continues to grow, and she is still saving money in her piggie bank for helping the pandas. Makena's innate passion for these beautiful creatures is truly something to behold, and will be with her for years to come. My name is Tyler. I am 9 years old and I live in Charlotte, NC. I am absolutely obsessed with all Pandas. When I discovered Giant Pandas were endangered I knew I had to do something. So, I thought what would be better than a lemonade stand on a hot summer day. I made posters and flyers that my friends and I hung up around the neighborhood. Then we set up the lemonade stand and made the lemonade. For the first couple of minutes we didn’t have any customers. Then it happened, our first customer! I was so excited I jumped straight to my feet! We poured him a glass and he came back for more! Everyone who came to get lemonade wanted more and more. At the end of the day we collected $80. Now I hope that is enough to help save the giant Pandas! During school this year, Brendan learned about China and found out that the giant panda is endangered. He became very concerned about this and wanted to do something to help. 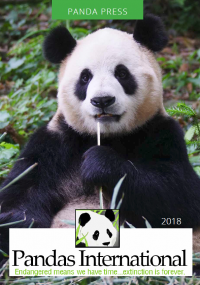 He researched how best to help pandas and different organizations to support and decided to hold a "Save the Pandas" charity event to support Pandas International since the money all goes to the pandas. He started by planning out the event, setting a date and sending invitations (I helped with this part). He decided to hold a craft and bake sale and invited some friends (Maia and Alexa) and his sister (Juliana) to help. They all worked together to decided what to make for the event. They ended up selling handmade bracelets, necklaces, bookmarks, and slime as well as chocolate chip cookies, blueberry muffins, rice Krispy treats, lemonade and coffee. There were also a few people who donated gift baskets that we sold raffle tickets for and raffled off. Brendan worked for weeks researching pandas to write facts about them on the bookmarks and spent hours making bracelets and necklaces. The event was for 2 hours and they worked hard to sell their goods. After the event, people who had heard about it but couldn't attend even sent them money in the mail! Finally after all donations were given, the kids total was $660.51! Brendan, Maia, Alexa, and Juliana are so excited to support the pandas and hope to one day visit the center in China. Thank you Brendan, Maia, Alexa and Juliana for your amazing support! 3rd Graders Raise Over a $1,000! Aaron picked Giant Pandas for a first grade research project. We read books and watched videos. Our family fell in love with these wonderful animals and visited their exhibits at the San Diego and National Zoos. Aaron decided to ask for donations instead of gifts at his 7th, then 8th AND now 9th birthday parties! The themes change over the years with his interests, but he always finds a way to include the pandas - as a Jedi, a basketball MVP, or a wizard! Thanks to generosity of friends and family, he collected $517 this year, raising over $1400 since June 2016 for Pandas International. Lu has a great love for animals. When he learned at school about Pandas International, he wanted to help. As an aspiring journalist, he decided to write newspapers that included humorous stories, reports on both local and world events, interviews, and illustrated comics to distribute to his friends and family in return for donations to his Pandas International fund. He had a great time creating the papers and was happy that he could personally do something to help save pandas. His newspapers were wildly popular and he raised $70. Lu is pictured in his “journalist” suit. Thank you Lu for your wonderful creativity and for helping the Pandas. Cora decided to have a panda themed 7th birthday because she loves pandas so much. She asked her friends and family to bring pennies for pandas to her party. The children counted and weighed the pennies. Later, a friend in her 20s who also loves pandas heard about it, and sent even more pennies. All in all, Cora collected $113 dollars worth of pennies for pandas. Her sister Elsa (4) really helped too. Both girls are excited to be Panda Protectors! Pandas International is a registered 501 (c)3 non profit organization :: EIN Tax ID: 84-1544557 Copyright © 2013 Pandas International. All rights reserved.